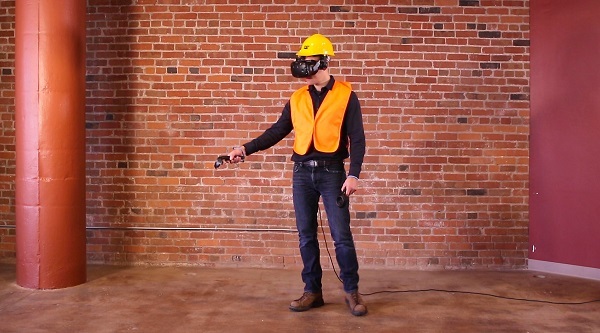 Caterpillar Safety Services announces the development of Cat Safety VR, a new virtual reality (VR) safety training module. Customized for paving applications, the new VR safety training solution immerses the trainee into a virtual four-lane rural highway construction site, so the employee learns to interact with coworkers and identify hazards in a safe and controlled environment. Road construction jobsites are full of hazards and distractions that create risks for employees, especially new workers. Tens-of-thousands of traffic accidents and hundreds of deaths are logged annually at road worksites throughout the United States. In-depth training related to specific road construction hazards, the importance of following proper procedures and effective communication among workers can help to reduce safety incidents at the jobsite. Once putting on the VR headset, the trainee is immersed in the virtual four-lane highway project for a site flyover and a pre-shift “huddle” with coworkers. A series of five scenarios then plays out during the training session, which is designed to show employees the many potential hazards associated with paving a highway adjacent to live traffic. After receiving instructions from the foreman, the user advances to the taper to inspect and installs traffic control devices, which helps employees to focus when encountered by unpredictable traffic traveling at a high rate of speed. Module scenarios at the paving train help the user to identify and negotiate blind spots, safely navigate around and between equipment, and improve communication with workers. As the module progresses, another setting features an excavator and coworker using a concrete saw to teach the importance of always wearing the proper personal protective equipment (PPE). Get more Caterpillar news here.